A blueprint for executing a successful direct mail fundraising campaign. Includes sample fundraising letters and a “swipe file” of 321 choice phrases. 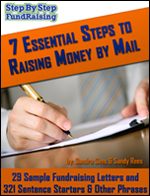 With these tools you’ll create a compelling fundraising letter that gets results!